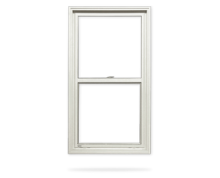 Opening at the bottom, Awning Windows are the perfect addition to any room where greater airflow is desired, even when the weather is less than ideal. 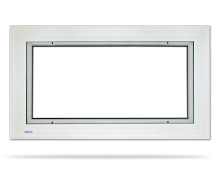 One of the first of their kind, Huron’s Awning Windows stand out from the crowd, with a more secure locking mechanism and a stronger seal to prevent air leaks. 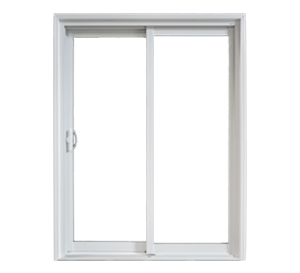 The metal locking mechanism prevents rust, bends and breakage, thereby preventing additional costs for replacements and providing you with a strong, secure and energy efficient window. 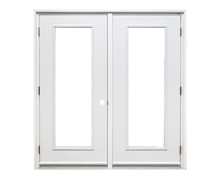 Windows are available for purchase in either our Huron line or our Ambiance line. Ideal for new home construction, the J Brickmould’s integral J Channel gives you installation options for different exterior applications (like stucco, siding, etc.). The J Brickmould also offers a variety of widths which allow you to enhance the beauty of any home, whether you prefer a look that is wider or more streamlined. Set your imagination free and see our product in action! Explore a range of colour options that will allow your Huron products to stand out and showcase your signature style. With 24 different colours to choose from in our selection of Spectrum® paints, you’re sure to find a hue to suit any style or trend. All Spectrum® paints go through an extensive testing process at our in-house facility to ensure they are durable, hardy and weather-proof so you can have peace of mind knowing your finish won’t chip or flake – ultimately saving you worry and hassle, and keeping more money in your pocket. 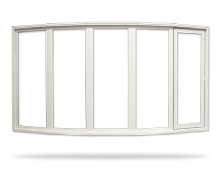 Internal Grilles are available for every Huron window type to add a traditional, contemporary or elegant look to your home. 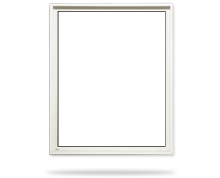 All Grilles are contained between two panes of insulated glass, requiring no maintenance to remain dust-free and secure. The glass surface is smooth and easy to clean. 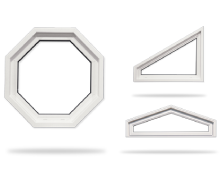 Grilles are available in a variety of styles, sizes, shapes and colours to suit the architectural design of your home. 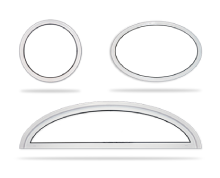 Custom Grille patterns available upon request. Please contact us for more information. 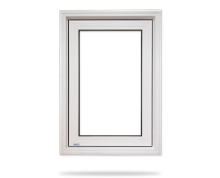 The choice is clear: triple glazing is the way to go for maximum energy efficiency and home comfort. 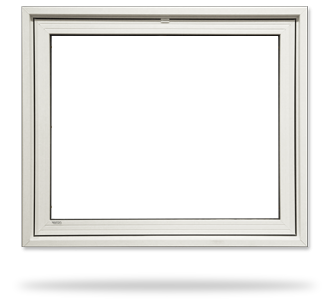 Huron recommends a minimum of triple glazing for all homes to protect from the condensation and moisture that often results in our extreme climate. Along with ensuring your home is running efficiently, triple glazing is also effective in reducing noise pollution so you can enjoy peace and quiet as well as peace of mind. Huron Window Corporation’s Dual Glazing option is the perfect choice for summer homes, cottages and sunrooms. Relax and enjoy the mild weather in style and comfort. The U-Channel is a uPVC member which allows various jamb extension materials to be adapted to the window jamb, giving you an integrated and seamless interior finish. The U-Channel accommodates any material you may have, including drywall or wood-veneered plywood, and gives you the flexibility to build into walls of any depth. 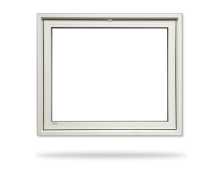 The Jamb Extension is a uPVC member that extends from the interior of your window frame to the interior wall finish. Build to any depth using the U-Channel. The PVC casing snaps easily into place in the Jamb Extension, giving you a seamless and maintenance-free finish. 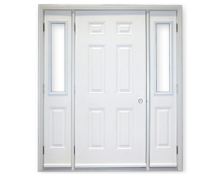 The PVC Interior Casing is a decorative trim that covers the inside edge of the jambs and the rough opening between the window and the wall. 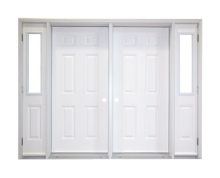 Our selection of 2” and 3” widths provides you with options, whether you’re renovating a room or building a new home entirely. 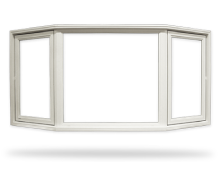 Dress up your PVC window interior trim with an authentic wood grain finish from our Sylvan offerings. The varied woodgrain options (Boston Cherry, Hillside Oak, Russian Maple and American Natural) are perfect for introducing an element of classic elegance and warmth into your home.